There's a lot of Junior Nation fans out there this season who are faced with a monumental decision. Since their main driver, Dale Earnhardt Jr., hung up his driving gloves and helmet in the Monster Energy NASCAR Cup Series at the end of the 2017 season, they are tasked with the challenge of selecting a new driver to be their on-track favorite. In the interest of full disclosure, let's get one thing straight: We know you are always going to love Dale Jr. He's going to be in your heart forever. But as a diehard NASCAR fan, you still need someone to cheer for each Sunday. We're here to help. It's really like an election year of sorts, so you need all the facts, stats, history and everything in between to be able to make an informed decision that's the best fit for you. Fortunately, for you the NASCAR fan, there's no Electoral College involved in this particular vote. It's just a straight up decision for which NASCAR Cup driver you like the best and feel would be most deserving of your cheers every weekend. It's the one driver that you're going to ultimately represent in public when you wear their team colors and gear. Yes, it's a big day. A very big day. We want you to have your selection fully locked and loaded so you'll be prepared to cheer that driver on when you attend the Food City 500 race week, April 13-15 at The Last Great Colosseum. Without further ado, here's a list of 12 drivers - in race car numerical order -- for your consideration. We have provided compelling reasons below why each driver would be a good fit to become YOUR new favorite driver. 00, Jeffrey Earnhardt - The last name says it all. You won't even have to change that big tattoo on your arm. Sure, he's still learning his way around the Cup garage, but give him some time and who knows, he could become the next Intimidator on the circuit, just like his famous Grandpa. Dale Jr. is his uncle, so by choosing Jeffrey you can keep it all in the family. 3, Austin Dillon - If you loved Dale Jr. because he was the son of the Intimidator, then you'll want to give some consideration to Austin Dillon because he drives the No. 3 car. Yes, the iconic 3 car. And he just won the Daytona 500, which both Dale Jr. and Dale Sr. accomplished. Austin has shown that he's coming into his own in the sport having earned both NASCAR Camping World Truck Series and NASCAR XFINITY Series championship titles, so this might just be the right time to become a Dillon fan. 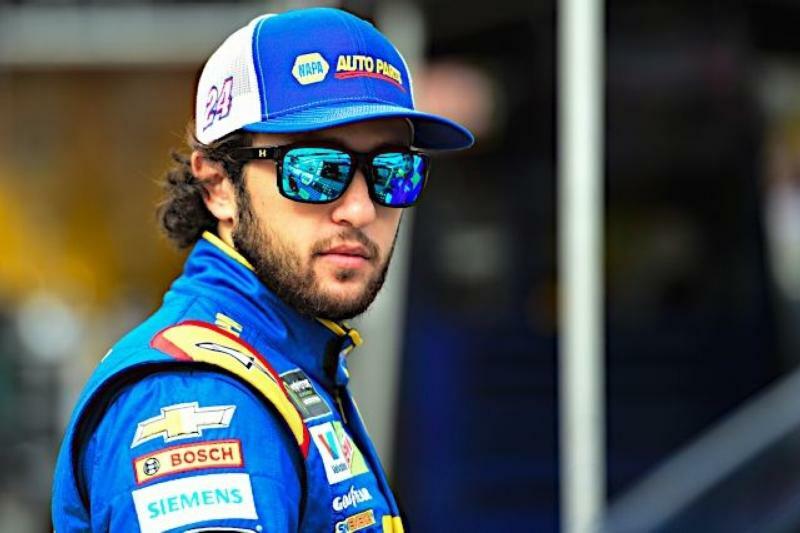 9, Chase Elliott - Like Dale Jr., Chase is a second-generation driver who had great success in the XFINITY Series and just like Little E has that similar 'It' factor where he can be relevant outside the NASCAR box, exposing the sport to a wider audience. He has also proven that he is an aggressive driver who appears to be on the right track to earn many victories and championships at the Cup level in his No. 9 Chevy. Better hurry and make a decision though, Chase Nation is filling up quickly. 12, Ryan Blaney - Some have said Blaney has that same Hollywood type star quality and swagger that the late Tim Richmond brought into the NASCAR garage in the 1980s and that Dale Jr. also possessed throughout his career. Also a second-generation driver, Blaney has proven he not only has personality and flair, but he has the skills on the track by winning his first race at Pocono last season and running up front deep into the 2017 Playoffs. A vote for Blaney would be a vote well spent, because this kid's going places. All aboard the Blaney train! 13, Ty Dillon - Austin's younger brother is determined to increase his NASCAR Q Rating this season by being more active on social media and engaging more fans. A driver who is the grandson of NASCAR Hall of Famer Richard Childress, Earnhardt Sr.'s longtime team owner, Ty has the pedigree that you need to help make your decision. Even if you don't select Ty as your new favorite driver, you should follow his Instagram and Twitter pages. You won't be sorry. 20, Erik Jones - Don't let this kid's quiet demeanor fool you, he's a beast on the race track. He's got all the moves and just like Dale Jr., he's had great success throughout each level of his career succession. He's driving the No. 20 Toyota for Joe Gibbs Racing and he has won the Fitzgerald Glider Kits 300 XFINITY Series race at BMS the past two seasons. He's got the total package, all he needs now is your full support. Vote Jones! 24, William Byron - One of two rookies in the sport this season, you are certain to get in on the ground floor as one of his brand new fans. One of the vaunted Young Guns who are expected to make a major impact in the sport, Byron has proven that he has all the tools to have a great career at the Cup level. Driving the No. 24 for Hendrick Motorsports, he has the equipment and resources behind him to help him win races and championships. He's young, but certainly worth serious consideration for your vote. 32, Matt DiBenedetto - This driver has an awesome personality and a great presence on social media. He's also eagerly accepting new fans, which is a good thing for you. It's a match made in stock car heaven. And hey, if he wasn't racing at the Cup level there's a pretty good chance he'd be right there with you in the BMS campgrounds and grandstands cheering on his favorite driver. Plus, he always picks the coolest songs during BMS driver intros. Go ahead, take a chance on the Everyman candidate. What's not to like? 42, Kyle Larson - One of the purest racers to come onto the Cup scene in quite a while, Larson likes to relax on his time off by traveling to dirt tracks and racing some more. Yes, he's certainly a gearhead's dream. In four full seasons he's steadily improved his performance at the controls of the No. 42 Chevy Camaro ZL1 for Chip Ganassi Racing and last year finished eighth with four victories and 15 top fives. He shows a lot of that Earnhardt grit and determination when he's behind the wheel, so he could easily be your guy. 43, Darrell "Bubba" Wallace - Darrell Wallace is another driver who has a huge personality and his social media following has exploded recently thanks to a breakout performance at the Daytona 500 where he finished second in the famed Richard Petty No. 43 Chevrolet. Bubba, as he's best known, is a driver who commands your utmost attention as you evaluate your options. Driven and determined, he's the first African-American driver to compete in a full season of Cup racing since Wendell Scott did it in 1971. He's got a lot of mojo, he's fun and he's not afraid to mash the gas pedal. We think he certainly touches all of the criteria boxes on your new driver checklist. 78, Martin Truex Jr. - One of Dale Jr.'s best friends, some of you may have already selected Truex as your new guy. That's understandable. He's the reigning Cup Series champion and he won eight races and posted 19 top fives in a dominating season-long performance in the No. 78 Toyota. If you are still on the fence, you may want to look here first. 88, Alex Bowman - If you love the 88 car, crew and team owner Rick Hendrick, you will naturally want to cheer on your new driver, Alex Bowman. Despite what you may have heard or read in the news, he's no Cup rookie. Bowman "The Showman" as he's called, has competed in two full seasons in 2014 and 2015 and subbed for Dale Jr. for 10 races in 2016. He knows the drill and he was the fastest qualifier at the Daytona 500 so he's off to a great start. Thank you for taking a look at all of the candidates we feel would be excellent choices to replace Dale Earnhardt Jr. as your new favorite Cup Series driver. OK, so no pressure, but we are confident you will make the best choice for you. And if one of these 12 drivers doesn't fit your specifications, feel free to browse through the other 25 to 28 available Cup drivers to see if you can find a better match. We wish you the best of luck, and on behalf of everyone at Bristol Motor Speedway, we approve this message. Once you've selected your new favorite Cup driver, you'll definitely want to come see him at the Food City 500 where there are so many cool options to make a complete weekend of family fun, including great video entertainment provided by Colossus, the world's largest center-hung video screen, premium VIP experiences like the Chairman's Experience, tailgating, on-site camping, concerts, great food and beverages in the concession stands throughout the property, and so much more. And for families who want to bring the entire clan, Bristol Motor Speedway officials are making it easier than ever for kids to have an awesome experience. Kids' tickets (12 and under) are free and adult tickets are $5 for Friday's (April 13) Bush's Beans Pole Day. On Saturday (April 14), kids' tickets are free and adult tickets start at $30 for the Fitzgerald 300 NASCAR XFINITY Series race and the Zombie Auto 150 NASCAR K&N Series event. On Sunday (April 15) adult tickets start at $60 for the Food City 500 and kids' tickets are $10. For all races, each child must have a physical ticket in hand to enter the gates. The Bristol Motor Speedway ticket office is the only authorized location that can produce the free kids' tickets.